but she did not know that it was Jesus. Jesus said to her, "Woman, why are you weeping? Whom do you seek?" tell me where you have laid him, and I will take him away." Jesus said to her, "Mary." She turned and said to him in Hebrew, "Rabboni!" (which means Teacher). The Church in her liturgy celebrates the Resurrection of our Lord Jesus Christ, the Redeemer of Man, on Easter Sunday, the culmination of Holy Week and the Lenten Season. All four Gospels date the Resurrection to the "first day of the week," but Matthew (28:1) and Mark (16:1) specifically add that it was after the "Sabbath was over." The Paschal Mystery of Christ, his Passion, Death, Resurrection, and Glorious Ascension, constitute one action for the salvation of mankind, for Jesus "was handed over to death for our trespasses and was raised for our justification" (Romans 4:25). Easter Sunday is called Resurrection Sunday among Middle East Christians and sometimes in the United States. The celebration of the Resurrection of Our Lord is known as Pascua in Spain and most of Latin America, Páscoa in Portugal and Brazil, Pâques in France, Pasqua in Italy, and Pascha in Greece. All four Gospel accounts record Mary Magdalene present at the empty tomb the morning of the Resurrection (Matthew 28:1, Mark 16:1, Luke 24:10, and John 20:1). 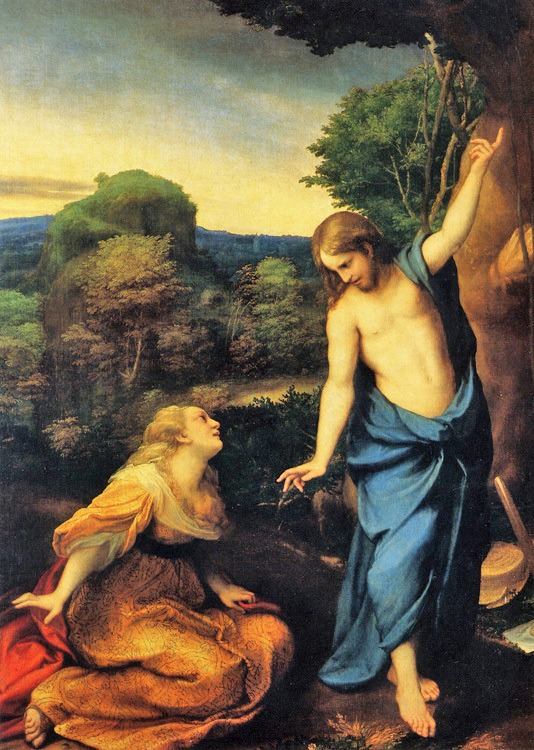 Jesus Christ made multiple appearances to his disciples for forty days following his Resurrection, the first to Mary Magdalene (Matthew 28:9-10, Mark 16:9, John 20:14-17). Christianity is the Resurrection Faith - Jesus opened the door to eternal life. St. Paul linked the Resurrection of Christ with the resurrection of all of us. "Or do you not know that all of us who have been baptized into Christ Jesus have been baptized into His death? Therefore we have been buried with Him through baptism into death, so that as Christ was raised from the dead through the glory of the Father, so we too might walk in newness of life" (Romans 6:3-4). most of whom are still living, though some have fallen asleep. St. Thomas Aquinas in the Summa Theologica reasoned is was necessary for Christ to rise again, one reason being "for the raising of our hope, since through seeing Christ, who is our head, rise again, we hope that we likewise shall rise again." He referred to Job 19:25-27 in Hebrew Scripture: "For I know that my Redeemer lives, and that at the last he will stand upon the earth; and after my skin has been thus destroyed, then in my flesh I shall see God, whom I shall see on my side, and my eyes shall behold, and not another. My heart faints within me!" Thomas Aquinas further discussed Christ's new manner of existence, that he had a glorified body. St. Thomas reasoned that Christ rose with a true body, for, in order for it to be a true Resurrection, it was necessary for his same body to be united with his soul. And we read in Luke that he ate a piece of baked fish in front of his disciples during his appearance in Jerusalem (Luke 24:43)! But he had a glorified body from his Resurrection, as St Paul relates, "if there is a natural body, there is also a spiritual body" (I Corinthians 15:44). Luke 24 contains four major scenes: the empty tomb (Luke 24:1-12), his presence on the journey to Emmaus (13-35), the appearance to his disciples in Jerusalem (36-49), and the Ascension of Christ (50-53). After the women and Peter had discovered the empty tomb, Christ appeared to two forlorn disciples on the road to Emmaus. They did not recognize him until at dinner, "he was at table with them, took the bread, blessed and broke it, and gave it to them" (24:30). 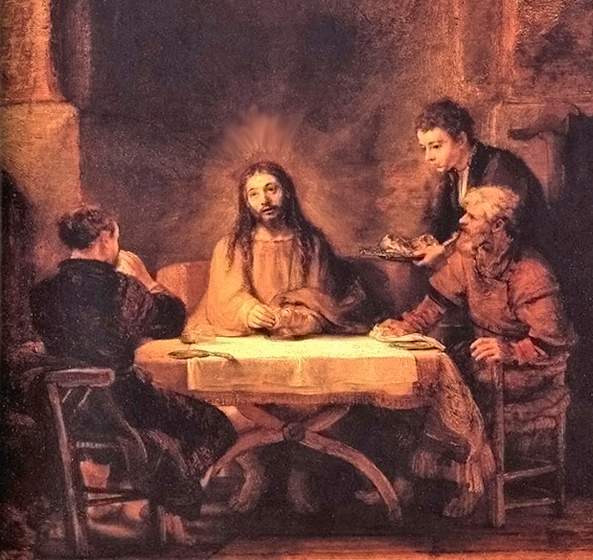 Reminiscent of the Feeding of the Multitude (9:10-17) and the Last Supper (22:14-20), the disciples recognized Christ, but at this point he suddenly vanished. As with us today, Christ was "made known to them in the breaking of the bread." “Stay with us, because it is almost evening and the day is now nearly over.” So he went in to stay with them. Then their eyes were opened, and they recognized him; and he vanished from their sight. 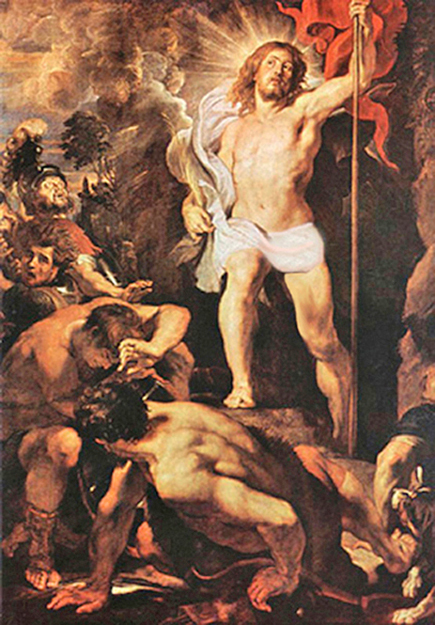 "The Lord has risen indeed, and he has appeared to Simon!" and how he had been made known to them in the breaking of the bread. Tannehill has observed the narrative unity of Luke's Gospel and his Acts of the Apostles, evident in Chapter One of Acts (1:3), where he continues to describe Christ after his Resurrection, that "he presented himself alive to them by many proofs after he had suffered, appearing to them for forty days and speaking about the Kingdom of God." After the risen Jesus promises he will send the Holy Spirit, Luke then recounts the Ascension of our Lord (1:9-11). The Lord's Day was recognized as early as the writing of the Book of Revelation (1:10). Sunday, the first day of the week, was the time the disciples gathered together to "break bread" (Acts 20:7). St. Ignatius of Antioch was an Apostolic Father who lived about 100 AD and served as the Bishop of Antioch. He reported on the Resurrection in his Letter to the Smyrnaeans (III, 1-3), and the celebration of the Lord's Day (rather than the Sabbath) in his Letter to the Magnesians (IX, 1). Pope Benedict, in his book Jesus of Nazareth - Holy Week, summarizes the Resurrection event by calling it "a historical event that nevertheless bursts open the dimensions of history and transcends it." The Sabbath, the seventh day of rest during the Creation, was celebrated as the day of worship for at least 2000 years. It must have been an improbable and miraculous event that so deeply moved the early Christians to produce the theological shift of the day of worship from the Sabbath to Sunday, the Lord's Day! 1 The Revised Standard Version of the Holy Bible. Ignatius Press, San Francisco, California, 2005. 2 St. Thomas Aquinas. Summa Theologica, Third Part, Book IV, On the Passion and Resurrection of Christ. Translation by the Fathers of the English Dominican Province, 1920. Reprinted by Christian Classics of Allen, Texas, 2304-2330, 1981. 3 Raymond Brown. "Aspects of New Testament Thought," New Jerome Biblical Commentary. Prentice Hall, Englewood Cliffs, New Jersey, 1990. 4 Brendan Byrne. The Hospitality of God: A Reading of Luke's Gospel. (Collegeville, Minnesota: Liturgical Press, 2000), 185-193. 5 Robert C. Tannehill. "The Risen Lord's Revelation," in The Narrative Unity of Luke-Acts, Volume I and II, Fortress Press, Minneapolis, 1990. 6 St. Ignatius of Antioch. in Kirsopp Lake (ed): The Apostolic Fathers, Volume I, Harvard University Press, Cambridge, Massachusetts, 1912. 7 Pope Benedict XVI. Jesus of Nazareth - Holy Week. (San Francisco: Ignatius Press, 2011), 273.